A Healthy Snack That's Profitable Too! A unique concept that's low cost and easy to get started. Air-popped corn that comes ready flavoured…. Looking For An Exciting New Business Opportunity? Following a highly successful rollout across Spain and Europe, Popcorn Vending provides opportunities to introduce this popular vending machine to the UK market. Our Popcorn vending machines provides the ultimate in hot popcorn delivery – sweet or salty, freshly popped with zero wastage or shrinkage. Bar owners love this machine as a tool to increase beverage sales! Be part of the commercial success across the UK with our highly successful vending machine. Sell Profitable Popcorn – no oil required for cooking no staff needed for popping! Self serve format, simply put it in a location indoors, that is accessible and convenient to consumers as they go about their day, where they can select a snack for themselves and pay at the machine. 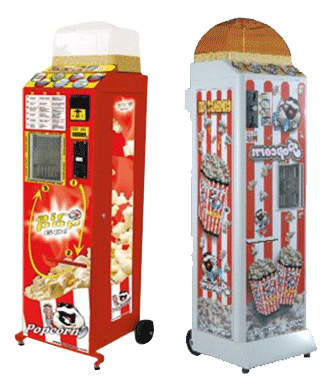 Popcorn vending machine is suitable for all the best Bars, Bowling Alleys, Leisure Centre’s, Shopping Centre’s and Workplaces. It’s also becoming increasingly common to find popcorn vending machines in Upmarket Bars, Corporate Lunchrooms, Workplaces, and Family Themed Pubs. Don’t miss this opportunity to be among the first to introduce these unique and proven machines to your market! Has striking branding, ensuring impulse buying and instant recognition wherever a customer may visit. Designed as a self-serve format, freshly popped at the push of a coin. No matter who is pushing the coin. All rights reserved © 2015 Fast Popcorn.